One Hot Lap: What? 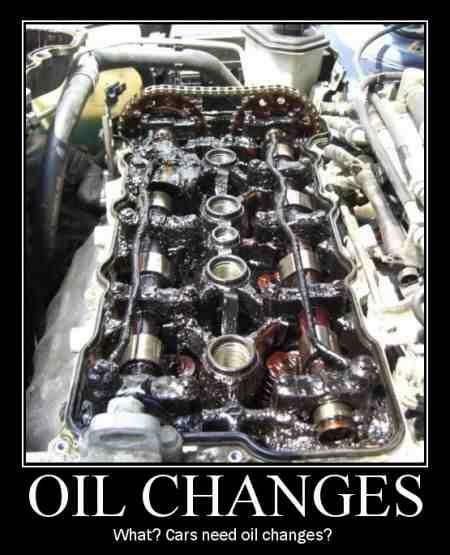 Cars Need Oil Changes?! Hat Tip to Chris C.
Yeah. That'll clean right up. A friend of mine handed off his Honda Civic to his son. About 2 years into his having taken over the car, the son and the father were talking about the car, and he mentioned that he should get some maintenance done on the car the next time he took it for an oil change. The kid was like "What do you mean, 'oil change'?" The father discovered the kid had no clue that a car required oil changes and thus hadn't done one since he'd taken over the car. They took it to a local Honda dealer for diagnosis, where the service advisor said they ran some cleaners through it to remove the sludge as best they could, but his suggestion was to sell the car ASAP as the engine was on borrowed time. Whoops. The last time I borrowed my father-in-law's Lancer, I decided to take a look at the basics on the car, knowing he's a hands-off kind of guy who believes recommendations and schedules are just ideas cooked up by someone trying to unnecessarily get you and your money separated as quickly as possible. I noticed the oil change reminder sticker showed a date over 2 years ago, and the odometer was only about 3K away from the printed mileage. I pulled out the oil dipstick, and saw what looked like frappuccino drip off the dipstick. I'd never seen something that was supposed to be oil look so watery. I took it to the local VIOC and rectified the situation. When my father-in-law asked why I was handing him an oil change receipt, I explained what I had found. His response? "I haven't driven that car far enough to require an oil change." I tried to explain it shouldn't go over so many months, and that his short trips of infrequent intervals required even greater oil maintenance, not less. He just laughed. "I haven't driven that car far enough to require an oil change." Classic! !